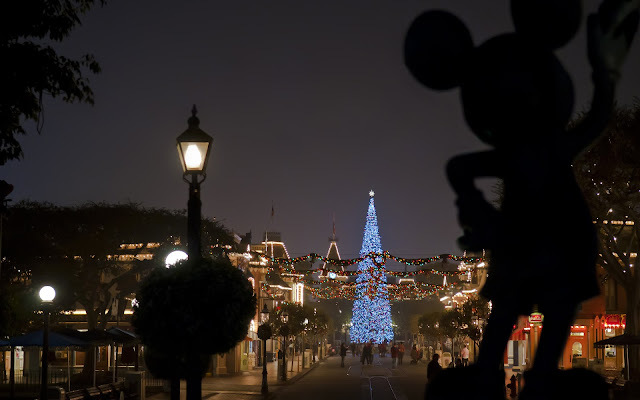 The other night, while shooting photos and closing out Disneyland park, I came upon this angle of Main Street. And looking down, I couldn't help imagine what it might be like if Mickey Mouse really was gazing down the entry thoroughfare of the park, enjoying the wonderful Christmas view, happy to see families and folks sauntering out after a joyous and magical holiday visit. I bet he'd be thrilled to see the infectious spirit of the season in everyone's heart. Then again, it all started with him, you know. Gazing down Main Street from The Hub.